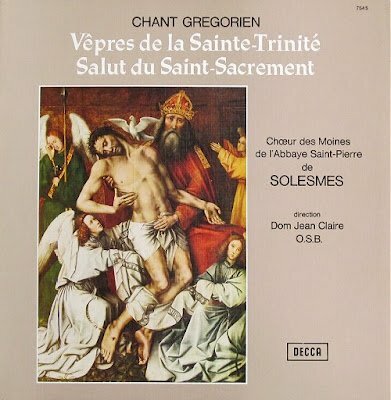 This 1972 Decca LP of the monks of L’Abbaye Saint-Pierre de Solesmes was the first recording of Gregorian chant that I bought, and in the eight years I have been blogging Gregorian chant has featured here many times, particularly as sung by the Benedictine community of Saint-Madeleine du Barroux. In 1972 the monks at Solesmes were speaking to the inner analogue with their LPs, but now their brothers at Le Barroux are speaking to the outer digital by streaming their Divine Offices online, complete with iPhone app for those seeking mobile spirituality. Le Barroux’s iPhone app is one of the more dramatic transgressions of set and setting, but it is symptomatic of a widespread problem. There is now, thankfully, a general understanding of how eco-systems mean that pollution in a stream can destroy life in a faraway ocean. But there is virtually no understanding of the workings of esoteric systems (eso-systems), as evidenced by the fallacy that a transcendental experience in a Provencal monastery can be shared by an iPhone user in New York. Classical music depends on emotional involvement. Yet research shows that increased accessibility and choice results in decreased emotional involvement. Could the message be any clearer?